The RS wheel block system is suitable for applications in which a housing made of sheet steel is required, such as for impact loads. The RS system is also employed in high-temperature applications up to 350 °C or wherever a stainless steel housing is needed. 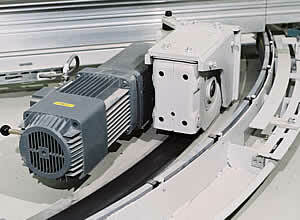 Various travel wheel designs and possible connections to superstructures make the system suitable for universal applications. integrated connections, e.g. for torque brackets, guide roller arrangements and buffers.